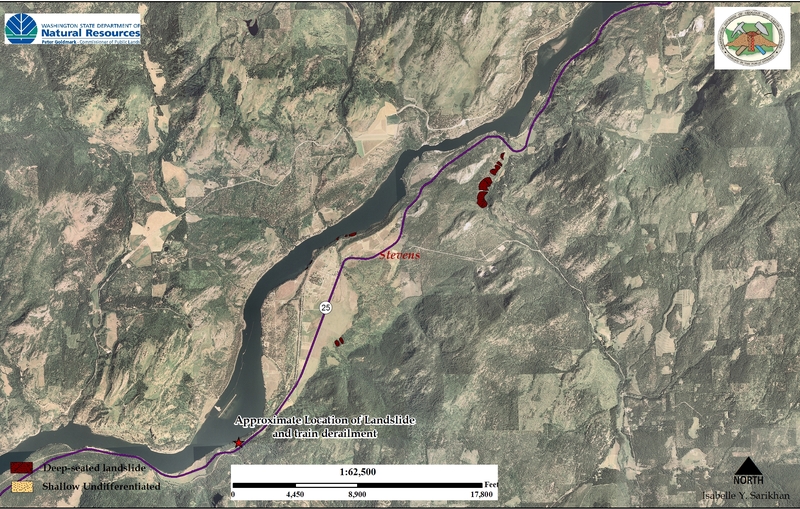 Trying to keep track of all of the landslides occurring in Washington State is a difficult task. Normally, I hear about most of the important ones via media reports, but this one escaped me, probably because of all of the activities following the January 7-8th storm. I am attempting to contact Ranger Adam Kelsey in regards to the exact location and any additional information on the landslide. This before photo clearly shows little debris at the base of the bluff. and gives an approximate idea of how large the landslide is in size. • April 8, 1944 – A four to five million cubic yard landslide from Reed Terrace generated a 30-foot wave, 5,000 feet away on the opposite shore of the lake about 98 miles above Grand Coulee Dam. 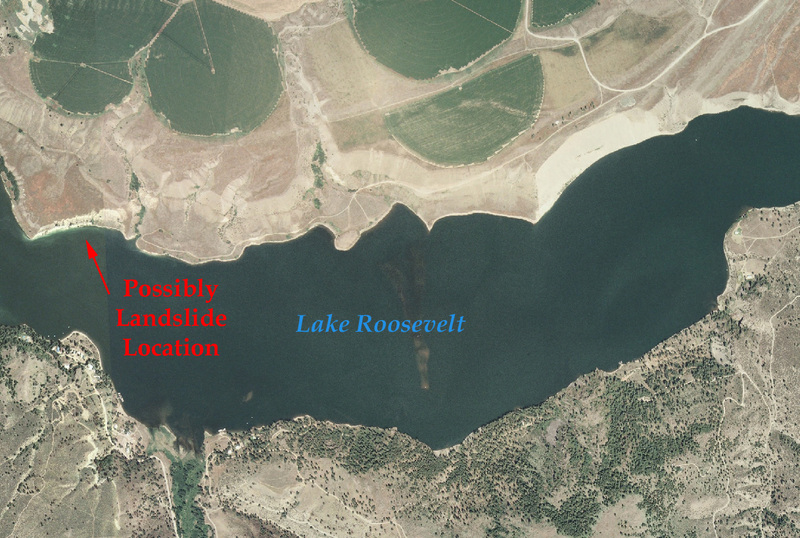 • July 27, 1949 – A two to three million cubic yard landslide near the mouth of Hawk Creek created a 65-foot wave that crossed the lake about 35 miles above Grand Coulee Dam; people 20 miles away observed the wave. • February 23, 1951 – A 100,000 to 200,000 cubic yard landslide just north of Kettle Falls created a wave that picked up logs at the Harter Lumber Company Mill and flung them through the mill 10 feet above lake level. • April 10 – 13, 1952 – A 15 million cubic yard landslide three miles below the Kettle Falls Bridge created a 65-foot wave that struck the opposite shore of the lake. People observed some waves six miles up the lake. • October 13, 1952 – A landslide 98 miles upstream of Grand Coulee Dam created a wave that broke tugboats and barges loose from their moorings at the Lafferty Transportation Company six miles away. It also swept logs and other debris over a large area above lake level. • February 1953 – A series of landslides about 100 miles upstream from Grand Coulee Dam generated a number of waves that crossed the lake and hit the opposite shore 16 feet above lake level. On average, observed waves crossed the 5,000-foot wide lake in about 90 seconds. “• April 8, 1944 – A four to five million cubic yard landslide from Reed Terrace generated wave, 5,000 feet away on the opposite shore of the lake about 98 miles above Dam. • April 10 – 13, 1952 – A 15 million cubic yard landslide three miles below the Kettle created a 65-foot wave that struck the opposite shore of the lake. People observed six miles up the lake. Static Liquification from water level changes and changes the surrounding hydrology probably does play a big roll in landslides, it is something that you can see in most of our major dammed lakes. There might be other triggers as well. In eastern Washington, there are certain triggers when looking at landslides. Potentially, agriculture can play a role in landslides along bluffs and in the long-term, the watering of crops above these bluffs does play a role. Chances are, they weren’t watering in January. The area also had a huge amount of snow this winter and January 16th was in that period where we had a warming trend. So, perhaps snow melt helped to increase the amount of water into the subsurface as well.